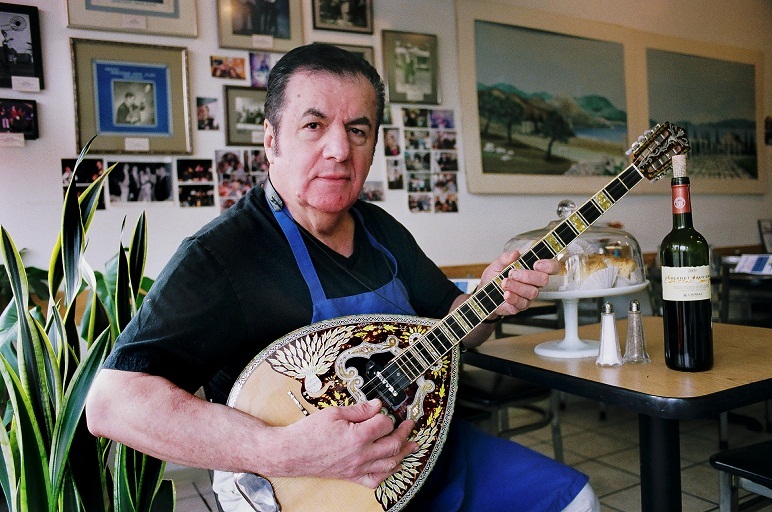 Taki plays his bouzouki in the dining room of Mad Greek, his restaurant. Taki acquired this noble status through his profound ability to improvise melodies and harmonies on the bouzouki. To see him play is like watching an imposition of dancing fingers over rigid metallic strings, causing matter to bend and dissonance to yield in gyrating flurries of notes. Historically, Taki is known as the first bouzouki player from his home town of Florina and one of the most accomplished bouzouki players in the world. Taki plays “rebetika” style, which is considered a variant of the blues in Greece. “Taxim,” or “improvisation,” is a pronounced characteristic of the style. In the early 1920’s in Greece, rebetika became the music of the people. In the song lyrics there are themes common with many marginalized populations of the world like poverty, drink, love, eroticism, death, war and work. Taki said that in the same way guitar is the prominent instrument in American blues, the bouzouki is the crowning instrument in rebetika. There are two versions of the bouzouki: an older and more traditional version with three double strings and a more modern version, which Taki plays, with four pairs of metal strings. Much like a twelve string guitar, the paired strings are tuned to the same note but separated in sound by octaves. The result is a very rich metallic sound. “Greek music is as rich as Greek history, and the bouzouki brings it all together,” said Taki’s wife, Kiki. For an American ear not accustomed to the bouzouki, rebetika sounds a bit like bluegrass, especially since the mandolin has a similar sound. However, rebetika has a unique Greek flavor all its own. The word “rebeticka” is associated with the oppression of Greek subcultures, which was the case in Greece in the 1930’s under a regime that enforced censorship and political unrest. The unique style became widespread and deluded drastically as more people played in port cities where there was an influx of people and culture from Asia minor. 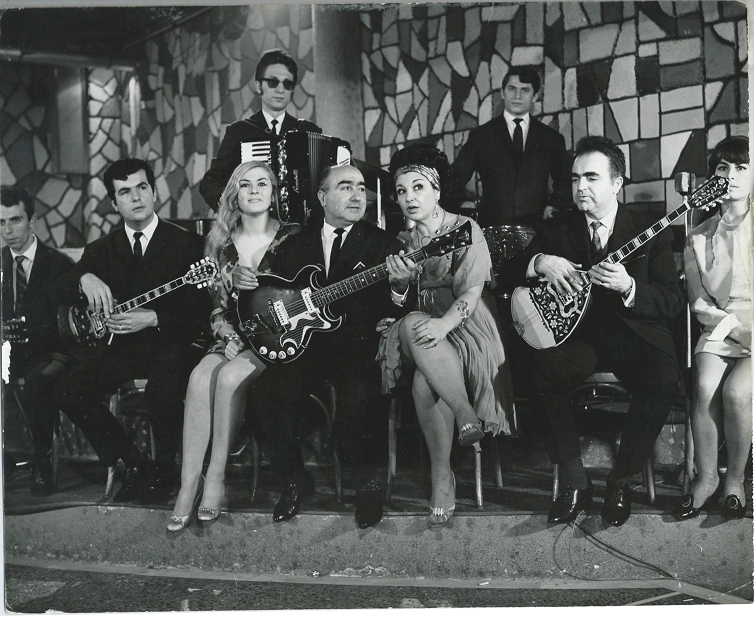 In the 1960’s there was a resurgence of rebetika in its original form. Through the 1970’s there was a revival in Greece and the United States, and Taki had the honor of playing with rebetika innovators and composers like Vassilis Tsitsanis and Yiannis Papaioanou. Early club promoters in Greece recognized his talent when, at age 19, Taki was a bus boy and waiter in a restaurant in Florina, a town in northwest Macedonia, Greece. “I would play for a half hour between shifts for some people there and then go back to working. I didn’t think much of it; I was practicing,” Taki said. Taki served two years in the military of Greece advancing to the rank of sergeant, playing his bouzouki in clubs every chance he could. “I’d play music on the weekends to make extra money. I’d get picked up by a taxi and go to a club to play, then later go back to the barracks,” Taki said. Taki’s popularity grew, and soon he found himself playing in many of the swankiest clubs in Athens. “I was in the right place at the right time and met a lot people that helped me,” Taki said. “I was pretty photogenic then … people still recognize me and call me when they see those old movies,” said Taki. In 1970 Taki was touring around the United States. He played mainly in clubs and special events, living in Hawaii, Texas, California, Canada, and finally Washington. “I meet club promoters and movie producers in Athens with American connections … It was big challenge and strange at first coming to the states. Back then I had a special visa, HZ, given to only musicians and cooks,” Taki said. “I was playing in Hawaii at a club called The Mad Greek in 1979, and a club promoter called me to play in Seattle, and I said ‘what’s Seattle?’ … and so at the time I felt like I needed a change and I went. When I arrived I thought it was so beautiful and the people were so nice,” Taki said. Taki began playing at the Grecian Corner that was located at 9th and Madison. He still traveled and played at eclectic venues in the United States and Canada, but by 1984 the demand for club players was slowing. Plus, Taki had also married his wife Vickie Panagiotopoulos. “I was only playing two nights a week, and because there are many Greeks in the food industry that I knew at the time, it was right for me to get into the restaurant business,” Taki said. Taki and Kiki bought their first restaurant in 1984, which was a Coffee Corral at the time. “It was rough in there and we had to spend a lot of time and money to clean it up and remodel, but in the end we had a great breakfast and lunch restaurant … and I was the chef making things like pancakes and eggs,” Taki said. Located at 7th and Stewart, they called their new restaurant “Taki’s,” which was their first out of a series of restaurants to appear in Seattle also named “Taki’s.” Each restaurant had different concepts, ranging from fish and chips to deli to pizza to, finally, Greek cuisine. Taki and Kiki, with their two sons, Elias and George, run their now only restaurant in Seattle, respectively named Taki’s Mad Greek, located just past NW 85th St. on 15th Ave NW. Twenty-year-old George, who is one of the Ballard High School football coaches, works full time at the restaurant prepping and cooking. “It’s pretty cool and stressful at the same time, but it’s not hard … I love cooking, and I know if I had to take over the restaurant tomorrow I could do it. But I think Elias would be the one to take it over in the future,” George said. “We cut and marinate all the meats on premises and make everything from scratch from our baklava to all dressings and dips,” Kiki said. While assembling the baklava by layering sheets of phyllo dough with butter, cinnamon, sugar, and crushed walnuts, Chef Taki explained that when he was young he performed at least six nights a week. “I am more choosey now. I do not need to play all the time, and I have a restaurant to run … prepping takes up most of my time, but it’s necessary if you want good fresh food -- fresh is best. It’s more than a passion, it’s a living and my customers need to leave happy,” Taki said. These days, Taki performs with his band, The Mad Greeks, every Saturday night at the restaurant. On these nights the restaurant is packed, lights dimmed, and a belly dancer or two mingle with diners while Taki and the Mad Greeks play old Greek folk songs and modern classics. At the center of the stage is Taki, focused in his element, hands in a dalliance of chance and beautiful, imperfect rhythm, his fingers stinging the bouzouki.